I headed to the Santa Rosa Original Certified Farmers Market this morning to stock up on delicious spring foods. It's been a while since I've been, and it was a homecoming of sorts, seeing lots of faces I haven't seen in a while. Jill is back, and now she is part of the team behind Beet Generation. And Les was there with his wonderful salad mix. And I got some great strawberries, asparagus, and shallots from Tom. Of course I always check the One World Sausage stand to see what delicious sausages Franco has, and it was wonderful to see Dennis at the booth. I also saw Dominique setting up her booth with lots of sweet baked goods. I really missed my friends at the Market! My bento today was filled with delicious foods from the Santa Rosa Original Certified Farmers Market. There's rice with some grilled steak topped with a few tiny sprigs of green garlic, strawberries from Tom at Armstrong Valley Farm, cherries (the gentleman who sold them to me says he and his family come to the Bay Area during cherry season and stay from Tuesday to Saturday in different hotels, then travel three and a half hours home. 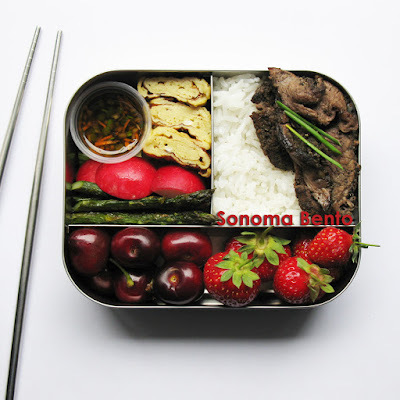 He says it is tough, but it is worth it for the relatively short cherry season), oven roasted asparagus from Tom, radishes, tamagoyaki egg omelette, and a little container of homemade marinade for the rice and steak. Whenever I buy strawberries, I always think of a tip from my friend Marcy. She says you should dip the strawberries in hot tap water for 30 seconds, then dry them and put them in the fridge. They will last up to 3 days longer with this method. Apparently it kills the bacteria on the berries. Check out Marcy's book Snacks for more cool facts! 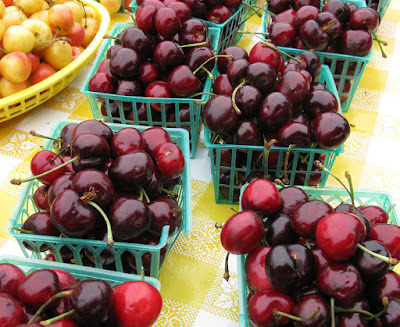 Baskets of delicious cherries from the Santa Rosa Original Certified Farmers Market. Heads up: I will be hosting a chef demonstration about bento at the Sonoma Marin Fair in Petaluma on Sunday, June 28th at noon! 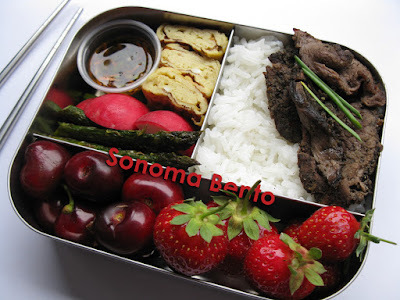 I hope you can make it to learn more tips on how to prepare bento using seasonal ingredients.